Ever since I moved to Dublin over three and a half years ago, I’ve been fascinated by its tech scene. Back then it seemed many companies were just setting up, but Ireland’s capital is now home to a fantastic combination of tech juggernauts, industry leaders and homegrown starts-up. What I have found interesting is the geographical areas these world-changing companies have located themselves in. For those starting out, seemingly, there’s no better place than the Digital Hub or the IFSC and surrounding area – with many start-up incubators located nearby. Those with longer memories will recall how the first wave of US tech companies came to Ireland in the 90s and set up shop in East Point Business Park and more recently in Sandyford. 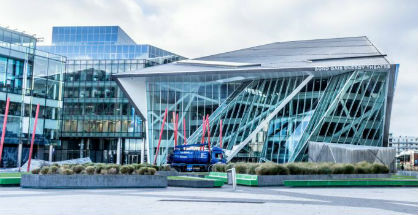 And within the last decade Grand Canal, or what is affectionately known as Silicon Docks, in a nod to San Francisco’s Silicon Valley has become the location of choice for many category-defining internet companies. While Ireland’s corporation tax will always attract headlines, it’s important to point out that Ireland boasts a well educated workforce, progressive immigration laws and high quality infrastructure. Companies may initially be attracted by tax rates and favourable conditions, but it’s the results they achieve once they’re here that makes them stay. Dublin is a good place for businesses and it’s a good place to do business. Successive governments deserve credit for creating this environment, as do IDA Ireland who court and assist many of the companies that move to the Emerald Isle. With what feels like a new european HQ springing up every single week I thought it would be fun to chart on a Google Map all the different tech companies – some well established, some up and coming, and most somewhere in between. I’m curious to see how Dublin, my adopted home is changing, and how these companies, I believe are helping it change for the better. I’m not talking purely in monetary terms about job creation, but the vibrancy, the sense of excitement and newfound confidence that comes from Dublin being able to call itself europe’s tech hub. The many tech companies operating out of Dublin have undeniably left an imprint on the city and enriched its character. Dublin is a more fun, more interesting and more exciting city with these companies on board. The city is home to a wonderful mix of people from all around the globe. Below is the map showing Silicon Docks and those companies which help make it what it is. To compile the locations I used Foursquare, Google search, company websites and my local knowledge of the area. If there’s a mistake, and there’s bound to be, or an update needs to be made, just let me know. I’ve listed 50 companies to begin with, but this is an ongoing project that i’ll continue to work on. Please feel free to use the map in any way you seem fit. If you do use it, i’d appreciate if you mention it’s from me and link back to the site. Thanks Ben. A great visual for us all.